Is China's Winter Olympics song a Frozen rip-off? From smartphones to designer handbags to cars even, counterfeiting has long been a part of Chinese industry, where trademarks can be a slippery concept. But a new accusation of intellectual borrowing has the potential to cause embarrassment at the highest levels. Keen (and not-so-keen) listeners have noticed that Beijing's Winter Olympics song sounds suspiciously like a runaway hit from the Disney musical Frozen. Beijing was awarded the 2022 games on Friday despite the city's lack of snow. Piggy-backing on the massive popularity of Frozen might be just the ticket to dampen down some of the criticisms levelled at the decision - from the lack of snow to China's poor human rights record. But just how similar are the two songs? 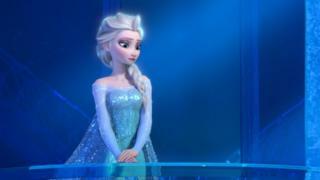 Judge for yourself: here's China's promotional number and here's Frozen's "Let It Go". The official YouTube video for the Chinese song has attracted hundreds of mocking comparisons - although because YouTube is blocked in China they are likely to be from Hong Kong, Taiwan, or other parts of Asia. "Does anyone want to burst out into 'Let It Go' at 01:14? ", said one user, Shiu-Wah Wong. "Plagiarism, stealing, copying - that's the only thing China can do," said another YouTube user, zn4807. "There's nothing you can do, this is China, from officials to the people, there's a culture of plagiarism, theft and copying." Chinese business magazine Caijing Online, cited by the New York Times, analysed the instrumentation in the songs and said they had similar prelude chords and an eight-beat introduction, and run at almost exactly the same tempo. No-one was available for comment at either the Beijing Games' organising committee or Disney. The Oscar-winning Frozen is the biggest animated feature of all time, having taken more than $1.3 bn (£790m) at the box office worldwide. Disney announced in March that it would release a sequel.